The passing of the Carbon Tax legislation sent shock waves through the business community – now everyone is worried about having to pay more for electricity, gas, etc. But Goodwill Engineering is not caught up in this hysteria, because they’ve already started reducing their carbon footprint way back in 2009! Goodwill embarked on an energy efficiency drive that was so successful that their energy use was slashed by more than 20% in less than two years. Then in early 2011, they installed a rooftop Photovoltaic (PV) system to produce some solar electricity. The combination of renewable energy utilisation and energy efficiency improvements would reduce Goodwill’s carbon footprint by 50%! An energy audit identified the major areas of use and actions to be taken. An energy policy was written, an energy reduction target was set, and practice/behavioural changes were put in place. Major technology changes were implemented after securing funding from the Jobs Fund. Goodwill’s achievements are possible because they have management commitment and staff support from the start. They also have assistance from an energy consultant (contracted by Perth Region NRM), who carried out an energy audit and facilitated energy actions, as well as funding from the Australian Government to implement some of the higher cost technology changes. 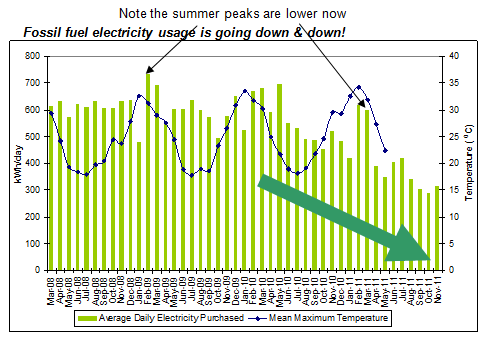 Fossil fuel electricity usage is going down & down! What the graph doesn’t show is that there has been an expansion at Goodwill, with additional employees and office space, since July 2011. Yet electricity usage is still going down!